Hello and welcome to the 273rd installment of the SWD. Free Syrian Army’s factions executed four Islamic State’s figures last night in Jarabulus Tahtani area. IS’ figures that were executed are; artillery commander Basil al-Hariri, security officer of Al-Bab city Abu Ali al-Ghazzawi, assistant of the IS’ judge in Jarabulus city Mohammed al-Kawsa, and housing and confiscation officer in Jarabulus city Abdo al-Qasim. How these IS’ figures were arrested in the first place is disputed, as one side says they were captured during the battles in the northern Aleppo, while the other side says that they were captured while entering northern Aleppo from Raqqa. Reports suggest that the executions were done by Ahrar al-Sham, while the group’s commander Abu Badr denied involvement in the act. Syrian Salvation Government, which operations in Hayat Tahrir al-Sham-held areas of Idlib, issued a statement warning Syrian Interim Government to close its offices in Idlib governorate in 72 hours. Prime Minister of the Syrian Interim Government, Jawad Abu Hatab called Free Syrian Army’s factions to defend the government’s offices in the governorate, in case of an attack by the Hayat Tahrir al-Sham. Syrian Arab army reportedly captured Al-Zahraa, Tell al-Zahraa (Tell Syriatel), and Tell Khanazir from the rebel forces in the administrative border area between Hama and Idlib governorates. Harakat Nour al-Deen al-Zenki agreed to coordinate military operations with Hayat Tahrir al-Sham, Ahrar al-Sham, and Jaysh al-Ahrar in Idlib/Hama governorates against the Syrian Arab Army. HNDZ‘s spokesman, Captain Abdul Salam Abdul Razzaq confirmed the coordination with other groups. Syrian Democratic Forces fully captured the village of Suwaidan from the Islamic State. 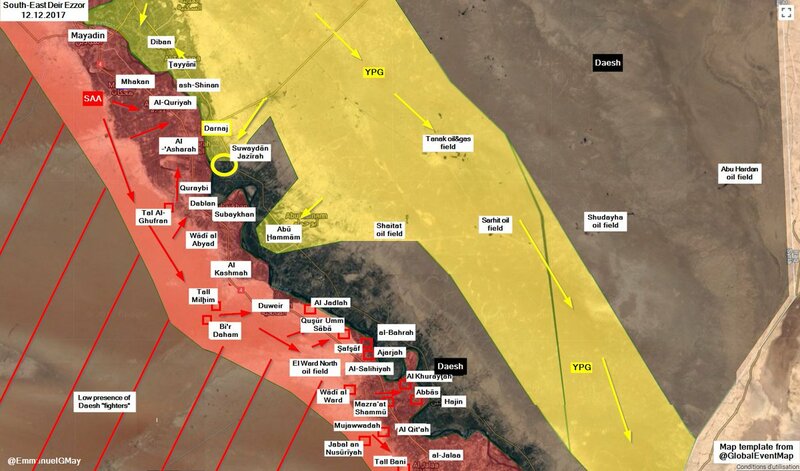 SDF‘s operations to fully secure the locality killed 273 Islamic State’s fighters, according to the statement from the Media Center of the Syrian Democratic Forces. Islamic State’s Amaq Agency claimed that IS’ snipers killed two SDF‘s fighters in Suwaidan village. Islamic State’s Amaq Agency reported capture of Al-Jala, Al-Siyal, Al-Abbas, Al-Majouda, Al-Salihiyah, and Al-Tawatuha north of Al-Bukamal (Albu Kamal) from the Syrian Arab Army, after yesterday’s reported capture of Al-Hasrat village. Amaq Agency claimed that 41 SAA‘s soldiers were killed and three captured during the clashes northwest of Al-Bukamal. Islamic State also engaged Syrian Arab Army near the village of Al-Kashma. Two anti-tank guided missiles reportedly destroyed a tank and a vehicle carrying several SAA‘s elements. Syrian Arab Army’s artillery shelling of Zemalka in the East Ghouta reportedly killed one and wounded two civilians. Faylaq al-Rahman’s factions agreed to a ceasefire agreement, after a dispute between the majority of the group led by Katibat 101 (101st Battalion) and Liwa Abu Musa al-Asheari (Abu Musa al-Ash’ari Brigade) was resolved by the committee of elders from Hammouriyah and the local council. Faylaq al-Rahman withdrew all of other group’s elements from Hammouriyah and only Liwa Abu Musa al-Asheari is present in the locality. Hayat Tahrir al-Sham arrested a number of its fighters in the East Ghouta, after reports spread that a large part of the fighters of the group is preparing to leave the region towards Idlib. Hayat Tahrir al-Sham, which numbers around 500 fighters in the East Ghouta, is currently torn apart into two camps, those that want to leave Ghouta and those that want to stay. Fighters that want to leave East Ghouta have already sold their property in the region and await evacuation. Islamic State-held areas in the south Damascus are experiencing internal differences, as fighters surrender daily and leaders accuse each other of treason. Main reason for these tensions in IS-held areas, are daily surrenders of IS commanders and their fighters from Al-Yarmouk camp to the Syrian Arab Army, through the Barada checkpoint, located between Al-Hajar al-Aswad and Al-Asali neighborhoods. IS’ leaders of Al-Hajar al-Aswad, Al-Yarmouk camp, and Al-Tadamon all operate individually without any coordination, and every new leader only amplifies isolation between IS-held areas. Coups in these IS-held areas are common occurrence as leaders mutually accuse each other of treason and belonging to the Syrian government. Current leader of IS-held Al-Tadamon neighborhood, Abu al-Ezz al-Amir is accused of being installed in the area by the Syrian government. Free Syrian Army’s Quwa Shabab al-Sunnah (Youth of Sunna Forces) detained and then released correspondent for Alan television channel, Mohammed al-Ghazzawi (Muhammad al-Hourani) in Bosra al-Sham. Al-Ghazzawi was reportedly detained because he defamed the group with reports of abuse in predominately Christian village of Kharba, which is controlled by Quwa Shabab al-Sunnah. Al-Ghazzawi denied these accusations and said he was verbally assaulted while detained. Fighters of Quwa Shabab al-Sunnah allegedly forced Al-Ghazzawi to take his clothes off, filmed him and threatened to publish the video clip if he publicizes the incident. Islamic State’s improvised explosive device reportedly destroyed Al-Hashd al-Shaabi (Popular Mobilization Units) vehicle in Jallam al-Dawr area, northeast of Samarra. According to a statement from the Islamic State’s Amaq Agency, two Islamic State’s improvised explosive devices killed five and wounded three elements of the Iraqi Federal Police in Al-Husseiniya and Al-Shieha areas of Hit (Heet). Iraq Joint Operations’ spokesman, Yahya Rasoul denied reports about an agreement with the Syrian Democratic Forces, regarding the establishment of a joint coordination center in order to ensure the security of the Iraqi-Syrian border from the Islamic State. Rasoul said that the two parties did have a meeting, but that the meeting did not result in the establishment of any joint center between the parties. Iraqi Army’s Colonel, Walid al-Dulaimi stated that the army’s engineering teams began establishing fortifications on the border, from the city of Al-Qaim to Rabia. Afghan National Security Forces’ operations against the Islamic Emirate of Afghanistan (Taliban) resulted in death of two and injury of three IEA fighters, as well as in destruction of an IEA position and two ammunition caches. Islamic Emirate of Afghanistan launched a large-scale offensive against the Afghan National Army in Mumin and Ghourtba areas of Khwaja Ghar district. Islamic Emirate of Afghanistan fully captured the vast, strategic Ghourtba area and ten checkpoints. Four ANA‘s soldiers were killed and three wounded in the clashes. Islamic Emirate of Afghanistan’s spokesman, Zabiullah Mujahid said that Khawajah Bahawodin and Dashti Qala districts are under the group’s siege and attacks. Mujahid also said that three checkpoints were captured in Dashti Qala district. Afghan National Security Forces’ bases are under attack in Al-Qanna area. Afghan National Security Forces wounded two fighters of the Islamic Emirate of Afghanistan, during the clashes between the two in the province. Afghan National Security Forces conducted operations against the Islamic Emirate of Afghanistan in Hisarak district, killing one and arresting five fighters of the group. United States Army’s soldier was killed and additional two injured after their vehicle slipped off the mountain in Vech Kut Echin area of Achin district. Islamic State and Islamic Emirate of Afghanistan clashed near the village of Ghazaw. Islamic State reportedly killed four fighters of the Islamic Emirate of Afghanistan in the clashes. Islamic State clashed with the Afghan National Army in Bira Khel area of Khogyani district, killing one and wounding 13 elements of ANA, including a commander. Afghan National Army’s commander, Turkel ibn Yusuf surrendered to the Islamic Emirate of Afghanistan in Saydabad with an assault rifle and a pistol. Islamic Emirate of Afghanistan ambushed Afghan National Army’s troops in Saydabad district. The attack killed one and wounded one soldier of the Afghan National Army. Islamic Emirate of Afghanistan stormed Afghan National Army’s military headquarters in Berri area, killing two and wounding one soldier. Afghan National Security Forces discovered 195 kilograms (430 pounds) of opium, two assault rifles and four motorcycles in Firozkooh district. One fighter of the Islamic Emirate of Afghanistan was killed and three arrested during the clashes with the ANSF. Islamic Emirate of Afghanistan captured Afghan National Army’s checkpoint in Shalgar directorate. IEA killed 10 ANA‘s elements during the capture of the checkpoint and seized an RPG launcher, several mortars, a DShK 1938 heavy machine gun, a PK machine gun, five assault rifles and large quantities of ammunition. Islamic Emirate of Afghanistan raided Afghan National Police’s checkpoint in Deh Yak district, killing two and wounding one element. Afghan National Security forces conducted operations against the Islamic Emirate of Afghanistan in Barmal district and killed 10 fighters of the group, as well as destroyed several weapons depots and ammunition caches. Afghan National Security Forces’ operations against the Islamic Emirate of Afghanistan in Farah district resulted in death of six IEA fighters and injury of additional five. Islamic Emirate of Afghanistan’s sniper killed a member of the Afghan National Police in Bashtrud directorate. Member of the Afghan National Police defected to the Islamic Emirate of Afghanistan with his assault rifle. Afghan National Security forces killed four and wounded eight fighters of the Islamic Emirate of Afghanistan, as well as destroyed four vehicles in Khash Rod district. Islamic Emirate of Afghanistan captured Afghan National Army’s checkpoint and killed eight soldiers in Jerash directorate. IEA seized a heavy machine gun and six motorcycles. IEA raided another ANA‘s checkpoint in the same directorate, killing seven soldiers. Islamic Emirate of Afghanistan’s improvised explosive devices destroyed a bus transporting Afghan National Army’s soldiers in Jerash directorate. At the moment, there are no information regarding the casualties from the explosion. Similarly, two IEA‘s improvised explosive devices destroyed a vehicle and an armored vehicle in the same directorate. Islamic Emirate of Afghanistan’s sniper killed an element of Afghan National Army and wounded another one in Jerash directorate.